Other reports have been quite alarmist on the re-laying of Undercliff Drive. OnTheWight has spoken to the Wildlife Trust and got a far more balanced response. The Hampshire and Isle of Wight Trust have issued a statement in relation to the new section of volunteer-rebuilt road on Undercliff Drive. The County Press reported on Monday that the Trust were considering legal action because of a small intrusion of the new road on SSSI land. The Trust has confirmed to OnTheWight today they “have no plans for further action”. 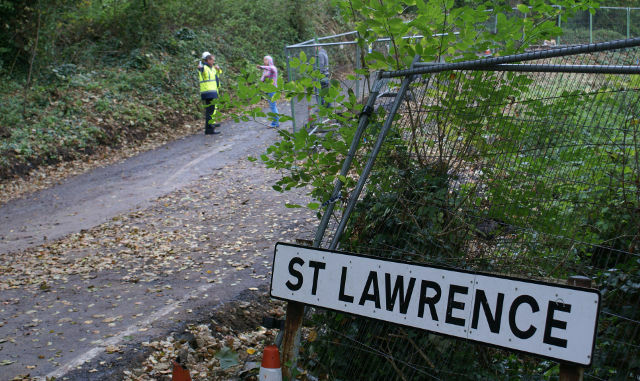 “The Wildlife Trust is fully sympathetic to the impact that the landslide has had on our neighbours. “Sometime in mid-October a replacement road has been built, reputedly by local residents frustrated at the slow progress of the local authority and their contractors in repairing the road. “It appears that the alignment of the replacement road has encroached upon part of the Wildlife Trust’s St Lawrence Woods Nature Reserve. This is a freehold property of the Wildlife Trust. As well as managing the site for wildlife we have responsibilities for people who are on our property. “The Wildlife Trust has erected signs advising people of the safety risks involved. 10 Comments on "Wildlife Trust ‘fully sympathetic’ to Undercliff residents"
“The County Press reported on Monday that the Trust were considering legal action because of a small intrusion of the new road on SSSI land. …. as I suggested previously, a smokescreen raised by C(onservative?) Press. What a shame the road builders didn’t consult all the landowners, Wildlife Trust included, before taking the action. They could have marked the SSSI boundary for them, preventing any damage. Like it or not, it is an offence to lay tarmac on a SSSI and something that could have been avoided. Agreed. I’m sure that Island Roads could have advised them on what materials to use as well. An outbreak of common sense and logic…… Shurely shome mistake! In light of his radio interview, perhaps Bill Murphy would like to comment? Let’s not hold our breath. Earlier today, I read and quite enjoyed the comment by ‘island guerilla’. From memory it was a refreshingly outspoken opinion about Mr Murphy. I hope the “investigation” will permit it’s re-appearance without too much editing. Using certain words to describe individuals on here is unhelpful and likely to attract complaint or legal argument. We must remember officers of the council enjoy free legal advice as part of their job. Perhaps we could see the missing post with the offending word redacted?